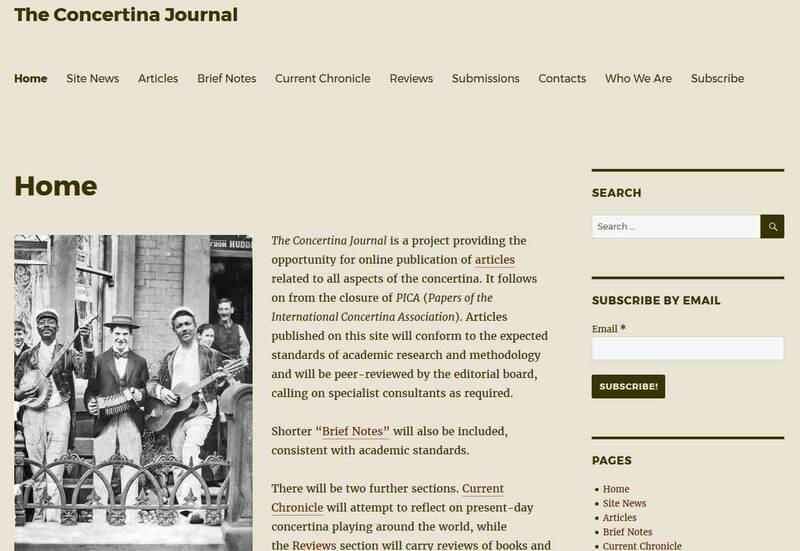 The Concertina Journal is a project providing the opportunity for online publication of articles related to all aspects of the concertina. It follows on from the closure of PICA (Papers of the International Concertina Association). Articles published on this site will conform to the expected standards of academic research and methodology and will be peer-reviewed by the editorial board, calling on specialist consultants as required. Shorter “Brief Notes” will also be included, consistent with academic standards. There will be two further sections. Current Chronicle will attempt to reflect on present-day concertina playing around the world, while the Reviews section will carry reviews of books and recordings.